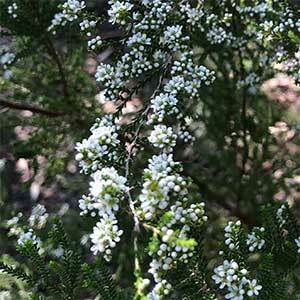 A small dense growing shrub Micromyrtus sessilis is from eastern Australia, commonly called the Heath Myrtle, it is most commonly found through New South Wales into Queensland. With a natural spreading and arching habit it will reach a height of around 1 metre and spread to 1.5 metres. This a plant that naturally grows in part shaded forested areas and will perform best in the garden when planted in similar conditions. Although attractive in flower and with good foliage this is a species that is not widely offered for sale. Growing well in poor and even rocky soils in open woodland areas, this is plant that requires good drainage and will benefit from a little afternoon shade. It will benefit from some mulch around the base to the drip line as this will provide a cool root run. Height – To around 1 metres, sometimes taller.